Like many Erikson fans everywhere, my curiosity was piqued when it was announced that the author would be publishing a Star Trek spoof. Personally, I've never been a Star Trek fan, but I was looking forward to reading Erikson's homage/parody. Considering how fun and humorous the Bauchelain and Korbal Broach novellas have always been, such a spoof promised to be hilarious. And the first two Willful Child installments were just that! The first volume garnered some negative and luke-warm reviews from readers expecting a blistering and fascinating foray into science fiction by the author. How could anyone have had such expectations after reading the cover blurb, I'll never know. This series was always meant to be a parody. Anyone expecting something dense and thought-provoking, or the Bridgeburners in space, was sure to be disappointed. And yet, for those who thoroughly enjoyed Willful Child and Willful Child: Wrath of Betty, I can tell you that this third installment is just as fun and entertaining as its predecessors. If anything, it's even more over-the-top! These are the adventures of the starship A.S.F. Willful Child. Its ongoing mission: to seek out strange new worlds on which to plant the Terran flag, to subjugate and if necessary obliterate new life-forms. We join the not terribly bright but exceedingly cocksure Captain Hadrian Sawback and his motley crew on board the Starship Willful Child for a series of devil-may-care, near-calamitous and downright chaotic adventures through the infinite vastness of interstellar space. 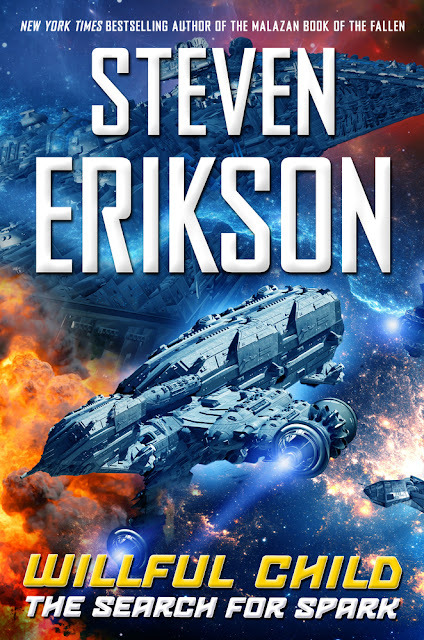 Steven Erikson has taken his lifelong passion for Star Trek and transformed it into a smart, inventive, and hugely entertaining spoof on the whole overblown mankind-exploring-space-for-the-good-of-all-species-but-trashing-stuff-with-a-lot-of-high-tech-gadgets-along-the-way adventure. The result is a novel that deftly parodies the genre while also paying fond homage to it. Steven Erikson is renowned for multilayered worldbuilding that resounds with depth, but once more this facet takes a backseat in this new Star Trek spoof. We get just enough to keep the story moving forward and that's it. This is a parody/comedy and nothing gets in the way of the rhythm so that the jokes and weird/funny situations can keep on coming. As I mentioned, Willful Child: The Search for Spark just might be even more over-the-top than the first two volumes. It appears that Erikson was gunning for at least a laugh/chuckle on every single page and it's pretty much what we get. Once again, Erikson's latest isn't a work that takes itself too seriously and it's a joyride from start to finish! And all current affairs topics are fair game. The author takes on Trump, Brexit, the rise of far Right movements, politicians, corruption, Disney's acquisition of Star Wars, capitalism, and many, many more! Following the hilarious misadventures of Captain Hadrian Sawback continues to be a riot. Sexist, incompetent, rude, too full of himself, and downright dumb at times, it's nonetheless impossible not to root for the poor guy. In every way, the man remains an over-the-top parody of the memorable Captain Kirk. Old-fashioned sexism, racism, and xenophobia often characterize his character, making him a throwback male protagonist from the 60S or the 70s. And understandably, he continues to take center stage in this novel. The supporting cast is comprised of incompetent crew members and a number of buxom female officers hand-picked by the captain for their looks and nothing else, as well as the recalcitrant chicken AI Tammy, and a few odd aliens along the way. Between Sawback and his incredibly inept crew, an AI from the future who wishes to see its captain fail miserably, Affiliation officers bent on orchestring Sawback's military and personal downfall, and friendly and not-so-friendly alien species populating known and unknown parts of interstellar space, how could things possibly go well for the Willful Child and its crew? Follow them on another unexpected and fun-filled journey across time, space and dimensions! Yes, the premise appears to be the same as that of its predecessors, but this work is more about the journey and not the destination. By removing much of the depth and the details that have come to define Erikson's fantasy works, Willful Child: The Search for Spark is another fast-paced book. There is never a dull moment within its pages. Although I much prefer Steven Erikson's Malazan installments, occasional fun romps like these wacky scifi parodies are like a breath of fresh air that show a totally different side of the author. In my last review, I said that time will tell just how many of these fun and entertaining science fiction comedies Erikson can get away with. As enjoyable as this third installment turned out to be, at times it felt as though things were a bit rehashed. I believe that fans will clamor for yet more adventures featuring the inimitable Captain Hadrian Sawback and his crew as the voyage of the Willful Child continues. But for now, it might be best for the author to concentrate his efforts on the Witness trilogy and to complete the Kharkanas trilogy. Still, if you are looking for yet another light and hilarious science fiction spoof, then Willful Child:The Search for Spark is just what the doctor ordered! Once again, this Star Trek parody/homage, with a number of Star Wars references thrown in for good measure, continues to work incredibly well. Don't miss out on another opportunity to journey deeply in the deepest depths of deep space. I'm listening to the audiobook and it's even funnier thanks to MacLeod Andrews who does an amazing job as the narrator. It sounds like a full-cast production. Definitely worth checking out! Just finished the book. Much of our society is gently tapped with a ball peen hammer on the forehead. He even includes a nod at a recent popular star faring clean up crew. To me Sawbuck seems a little restrained this time around if unmoving in his desires. A lotta good laughs. The phone number to get more information on the great classics of flea based writing had me laughing for a while. No spoilers, but one bit of maybe wrongly remembered dialog. Sawbuck,"What drugs are you on Buck?" Buck reply's,"All of them Captain."